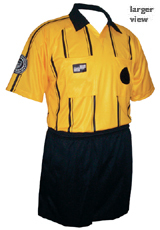 Official Referee Uniforms 2009- This is the official referee uniform for Spring 2009. The primary color worn by newly certified referees is yellow (shown here). Black is the second color of choice. Referee Pay Spring 2011 *- This document outline the pay schedule for compensating referees for the various positions (examples: Center versus AR, Travel versus Academy or Intramural, and team size GU9 versus BU13).